SAVAGE DRAGON: THE NEXT GENERATION! Malcolm Dragon has big shoes to fill. His father saved the world on a few occasions and kept Chicago’s notorious criminal organization the Vicious Circle at bay for decades — can the younger Dragon hope to live up to the legacy of his famous father? Not if the new nemesis Torment has anything to say about it! With a benevolent voice in one ear and a sadistic one in the other, he may just be the most conflicted killer of them all, and Malcolm Dragon is the only one standing in the path of this fearsome new foe! Art-Erik Larsen outdoes himself this issue channeling classic Kirby in each and every panel. Ive heard a great many things about Larsen’s art, both good and bad. This issue is very good on every level. The choreography was tight, the details were present and he manages to both have a smooth finish while preserving some of his trademarked edge. I love it! Life of a celebrity– Larsen creates a pretty interesting situation to Malcolm this issue with the groupies. It’s a testament to his more wholesome personality that he turned down the sexual favors on offer. Humor– It was particularly hilarious how his friend went on and on about the Beyonce booty on offer. Good stuff Erik! Story– A young Malcolm witnesses his “mother” get killed by a monster during a crisis. He is quickly whisked away by Mighty Man who reveals his mother is not dead and they have an emotional reunion. That Night, Malcolm overhears the truth that neither woman is his mother but instead other dimensional counterparts. In the present he battles Torment. At first the villain eludes him and he returns to his apartment where some groupies follow him back into action. Tremor attacks again and the women are killed angering Malcolm who thrashes the villain then flash fries him with his electric powers. Black Hero– If you don’t know yet you need to get into Malcolm Dragon! One of the freshest superheroes out from Image comics right now! Cover- I glossed over it last issue but the new logo for this book has a letter man jacket kind of feel presumably because Malcolm is in High School. It’s simple but has allot of underlying meaning. The cover also harkens back to a time when covers actually had something to do with the story inside. This is vintage 90’s and I’m digging it to the core. Action- It’s been awhile since I read a comic where there was an all out knock down drag out fight like this one. I loved it! Every destructive and well rendered blow! This is the stuff the 90’s were made off and Larsen gives it to us like it’s 1992. I freaking love it! All you action junkies out there you need to get into Savage Dragon right now. Throwback feel– The 90’s feel may put some off. 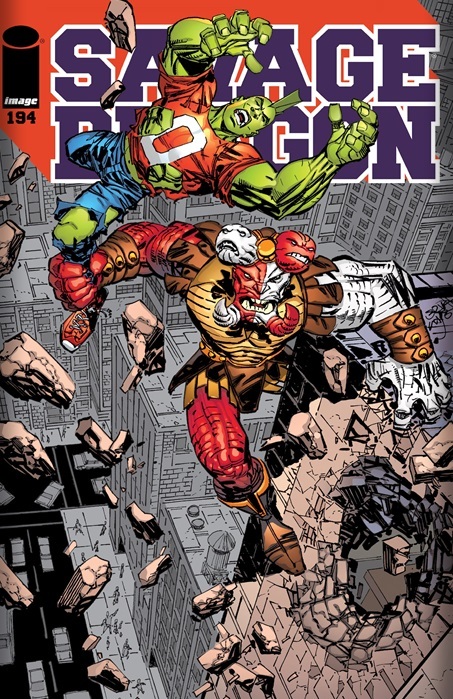 Art– Erik Larsen’s art is an acquired taste allot like Rob Liefeld and Todd Mcralane, if your not a fan stay away. Background– Honestly to truly understand the flashback you would have to be a Savage Dragon veteran a wiki can only put so much into context unless you actually read the tale. This is disappointing since it would have nice to have this new lease on Savage Dragon be accompanied by a fully accessible tale to new readers. I like that the young hero with all the pressure of being a hero and a student, can still restrain himself from being overly sexualised. He even has a hood friend and still remain himself. I can personally relate to that. Savage Dragon is still one of the best books on the shelves!